1. First notification of a new assignment. 2. Initial emails from York. 3. Registering for the adjuster web page. 4. Get started in FileTrac: Logging in, accepting the claim, viewing supporting documents, identifying the desk adjuster and client. All claim assignments are made by Parker Dykes, our claims manager, via phone or email. Claim type and location will be relayed in the call, where you will verbally accept the assignment. 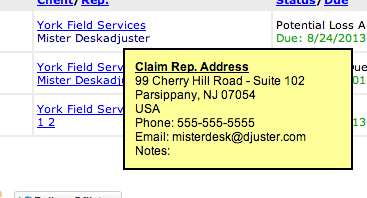 The first email is auto-generated from FileTrac, notifying you of the new claim. The above email gives you the FileTrac access information and also provides a link to get signed up for access to our adjuster webpage. The York welcome email provides a link to sign up for access to our adjuster webpage. Only those on our active roster are permitted to access this exclusive page. Logging into FileTrac is simple. Once you have successfully entered this information, you will be taken to the FileTrac Alerts Page. Clicking on Manage Claims from the Alerts Page will take you to a listing of your open files. The status of the assignment reads, "Assignment Issued" until you accept it in the system. At the top of the claim information screen you are prompted to scroll down in order to accept the file. Clicking on Accept will update the status and make this an 'Active' claim in your queue. Clicking on Reports will open the file to view all uploaded documents. Anywhere you see the 'eye' icon is your prompt to view a document. Imagine this section as a file drawer, containing all the pertinent information concerning the assignment. The client is listed under the Client/Rep. column in FileTrac directly above the desk analysts name. Identifying the client is important for determining which forms to use and specific instructions to follow.